I’m just not good with change, Yvonne would be the first person to tell you that. A few weeks back, we signed a lease, that will ensure our small family run craft school will remain in its current location for at least another ten years. As I reflect back on the nearly decade and a half in our current location I am filled with a deep sense of gratitude for all the beautiful work, but mostly the beautiful people who have past through our doors. On behave of Yvonne and myself, thank you. We returned from Portland and our visit to our friends at Gilmer Wood Company, with several blanks for planes and wood for pulls and latches in various exotics not on the Cities list. I hand picked an epic plank of 5/4 Cedar of Lebanon, a 12/4 wonderful plank of Swiss Pear and five pristine planks of 8/4 Sucupira all of which is being shipped to the school. Brett and Torrie stand beside two of their exceptional finds during our annual woodrun to Portland which took place the day after our term ended. At Goby Walnut some of the finds were English Walnut, Oregon Walnut, Myrtle, figured walnut, and Madrone, what we call arbutus in Canada. Before heading out on our wood run, we received our annual shipment from A & M Wood Specialty in Cambridge Ontario. In this years shipment included Burmese teak, narra and English brown oak. We also purchased some 8/4 ipe for plane making. Yesterday, I received word from a friend, also an alumni of the school telling me of a Vancouver Island woodworker selling off all his wood. The wood being sold was wood that had been carefully selected over the past 43 years, wood dating back from the early years at A & M and Unicorn. Tulipwood, English brown oak, European pear, English elm, various rosewoods, South American and Cuban mahogany. After talking things over with Yvonne, we rented a truck and will be heading over to the Island in the next few days. A student recently said to me that it is Yvonne really is the glue that binds everything at the school together. She loves working with the students and tolerates the office work better than anyone I know. Over the past two terms, she has really embraced the machine maintenance at the school. While I have always taken pride in the state of our facility and machines, in a recent feedback form from one of our returning students, they suggested that the machines have been at their best since Yvonne took them on. Over the last few weeks of this past term, Caroline replace all the fences on Jk’s table saw, the Wadkin dimension saw and the General table saw. In the coming term she will be replacing the fences on both the General shapers. She is using some well seasoned European beech that Yvonne milled at the beginning of last summer’s term. The image above, was taken by a student on Friday evening. While Yvonne and the students were enjoying a pint, I sat at the front bench and refined a stet of pins on my drawer. I was lost in the work, something that has been happening more often in my life since I have cut back on teaching and returning to my own work. While Saturdays continue to be my favorite day of the week at the school. With the machines off, it gives me a chance to have quiet conversations with our students. I have yet another reason to look forward to on the weekends in the coming term. On Sunday mornings, when our students are sleeping in or catching up on their chores, Caroline and I will be heading into the school for amateur development. I have a set of four chairs in narra, that have been sitting under Jim’s bench in my workshop for a few years now. Over the break, I took the parts down to the school and found a place to store them. Caroline and I have had very little time together in the workshop since she took on a teaching role at the school. I am very much looking forward to spending this time with my co teacher and friend as we will be working on the chairs for a few hours each Sunday morning. In the first week of the program I tell students that the two of the most important things they will learn at the school, they learn in the first week; one of these things is a very much neglected aspect of our craft, grain graphics. Shortly after leaving my spacious mountain side workshop just outside the Banff National Park gates; a rather large, glass front workshop with two skylights over looking mount Rundle to a small dimly light workshop in behind our Exshaw home, I discovered just how important grain graphics is in our work. Its where I had been the most happy in my work, up until recently. It was in that little workshop in the mountains that I really discovered the playfulness in the use of grain graphics. Jim talks about the use of graphics in his books. 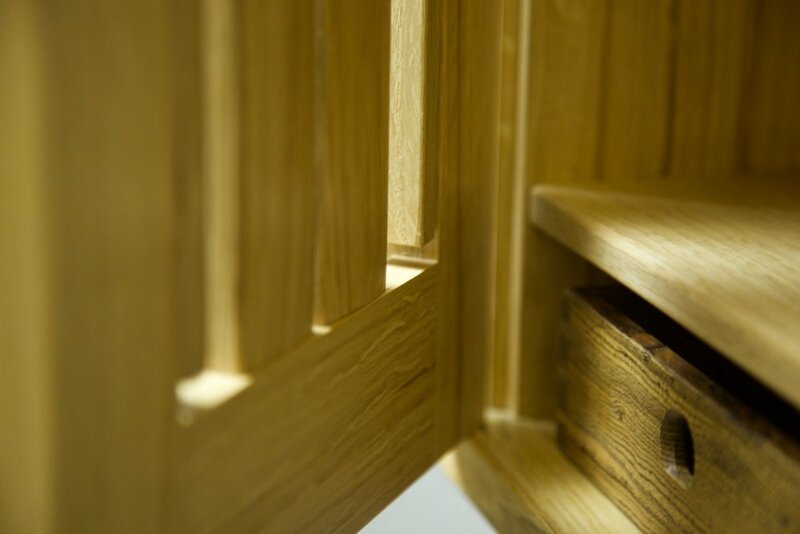 In The Fine Art of Cabinetmaking, on page 33, he does an admirable job illustrating with photographs and text what is a inherently difficult subject to articulate in words. 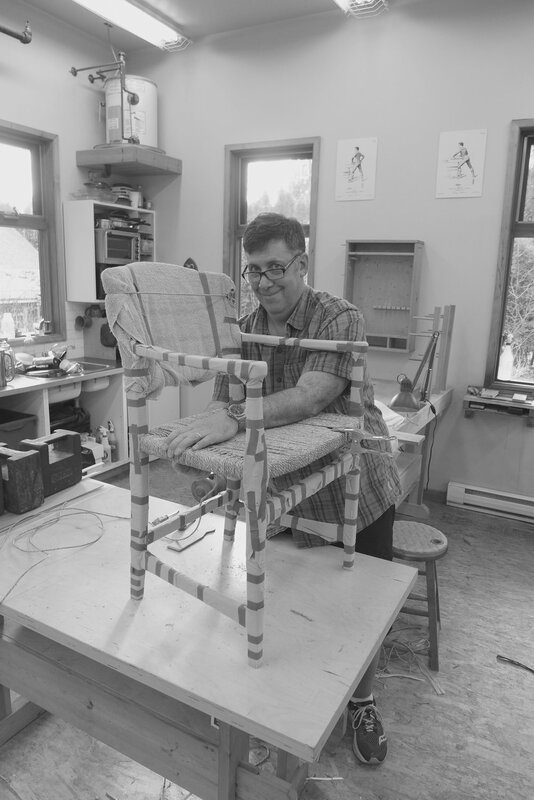 I had spoke to him about this before, but it was while making two rocking chairs for a client in the Netherlands, that it really hit home for me. I had just cut the crest rails for the chairs, the first chair was in olive ash the second in figured eastern maple. While the chairs were essentially identical, as Jim talks about in the Impractical Cabinetmaker, different woods gave each of the chairs, a very different feel. Some of the dimensions had been adjusted. I had straighten the grain and it was rift to flat sawn. I cut the curves and the rails were clamped in place. It was then, when I immediately realized that I had reversed one before cutting the curve. The crest rail on the chair in ash, with very dominate annual rings and lovely colour had strong oval pattern in the center. While it was symmetrical, it was not harmonious with the shape of the rail, and not what I had hoped for. The chair in maple had a stretched pattern, which was my intention, however due to the fine grain and heavy figure it was less noticeable. 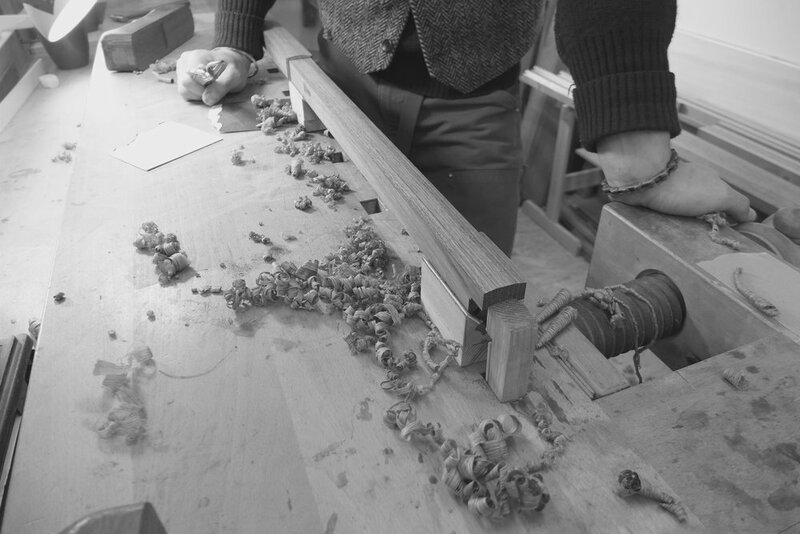 I looked through what was left of the plank of olive ash and was unable to find the stock for another rail in a similar cut to that of the maple chair. I was able rotate and straighten a piece, giving me rift cut with a a bit of colour to the bottom at the back. Cutting the curve in this piece changed everything for me. Now, I couldn’t leave the rail in the maple chair I returned to what was left of the figured maple plank and was able to rotate the stock for a similar cut. This was the starting point for my fascination with the use of grain graphics in my work. This would later become an obsession when I made Vidar’s chair and was unable to find stock thick enough for the crest rail. On a quiet Sunday in the school back in 2006, I made a discovery that enabled me to get the crest rail for that chair in 8/4 stock, which up until that point had only been made with a minimum of 12/4 stock. The method continues to be used at our school when making Vidar’s chair, and has been adopted by our friends at the Krenov School where the chair continues to be made on occasion. Jim often spoke of the importance of curiosity in our work. 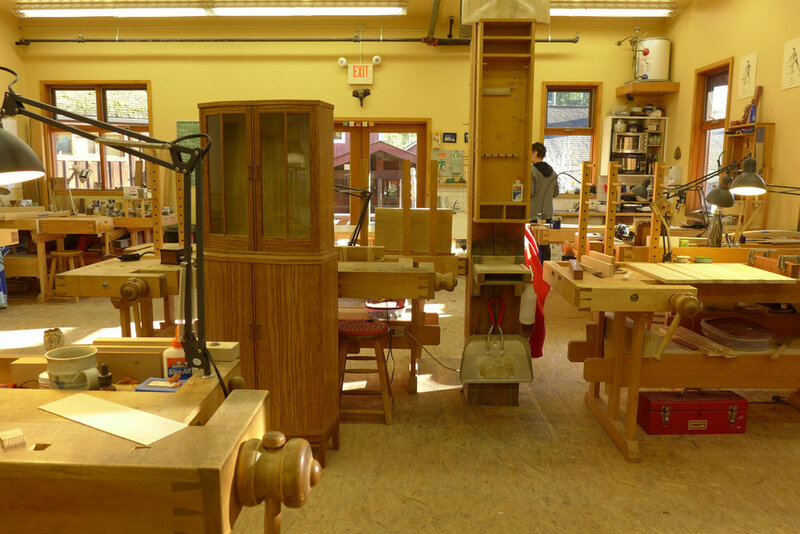 Andi completed Vidar’s Chair program this past summer, and in the fall was invited to give a presentation at the local wood guild to present his chair, talk about his experience building it, and talk about the significance of this chair at our school. Jim suggested to our students that it is an emotional craft. While we do not open the reproduction for any interpretation or change, each chair reflects the sensitivity of the student making it and is evident in the details such as edge treatment. Andi just completed his fifth term at the school and will be staying on for another term with the residency program. 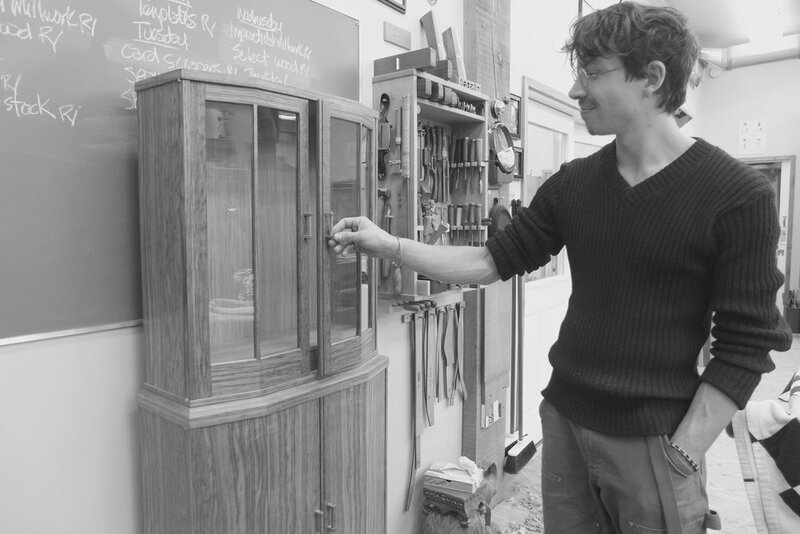 In this past term, Andi, as the first recipient of the Doug Ives Scholarship, completed rather large showcase cabinet in English Brown Oak mid term. He has moved onto another large cabinet with integrated stand in kwila, doussie and boat wood, a lovely piece of vary heavy wood that we are unable to identify donated by a local boatbuilder. Marion completed her reproduction of Jim’s games box in French walnut in the Upward Spiral Program. It features a sliding lid with lock, and whimsical use of the delicate fine grained wood. Marion has discovered the playful use of Parquetry in the Composing program and will be staying of for a short residency before returning to France at the end of March. She is shown here selecting her shop sawn english walnut veneers with Robert for her parquetry lap desk. The images above show Andre’s pipe cabinet reproduction in garry oak with a tray of bocote. Above he is shown wrapping his chair in the final days of Vidar's Chair program at the school. I am very much looking forward to Andre’s return for the Composing program this fall. The chair was a gift for his lovely wife Andrea. 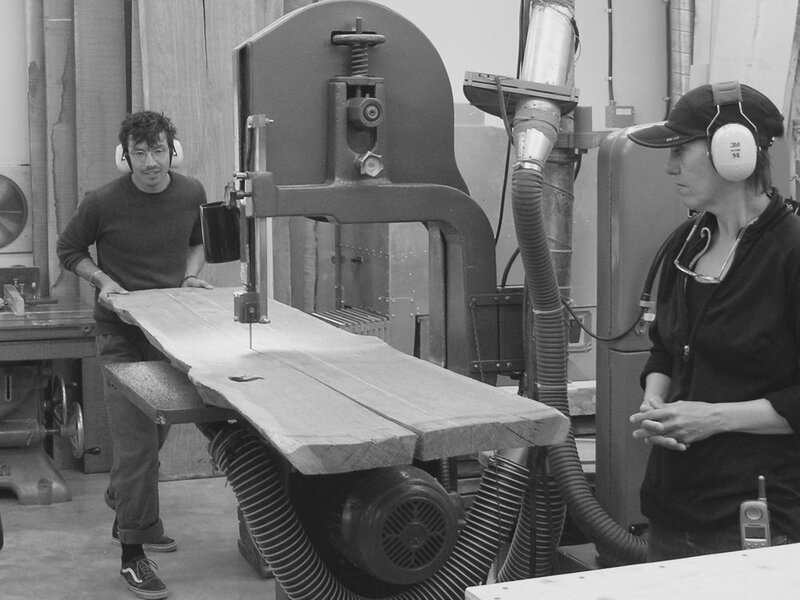 Just a few days after completing his chair, he joined us on another another epic wood run to Portland. The enthusiasm shown by our students on the wood run was worth the trip for me. Tang completed his reproduction of JK’s pipe cabinet during his Upward Spiral program this past fall. He chose doussie, one of Jim’s favorite wood, wit the tray of cocobolo. The doussie has a similar feel, yet different than the English brown oak that Jim used on the two versions he made the originals. Last spring in the Upward Spiral program Leanne completed this lovely curved front wall cabinet in makore with locally harvested spalted maple back panel. The drawers are amazonian rosewood. The frame and panel back features a veneered section in behind the drawers and pocket using lumber core and shop sawn veneers. Leanne is currently building a tiny home in Roberts Creek. Torrie, from Vancouver just completed his Upward Spiral program at the school, shown during a walkaround. The walkaround, is an opportunity for students to share the triumphs and tragedies of their work. His ambitious curved front cabinet with dovetailed case in the background with three curved front drawers in granadillo underway. 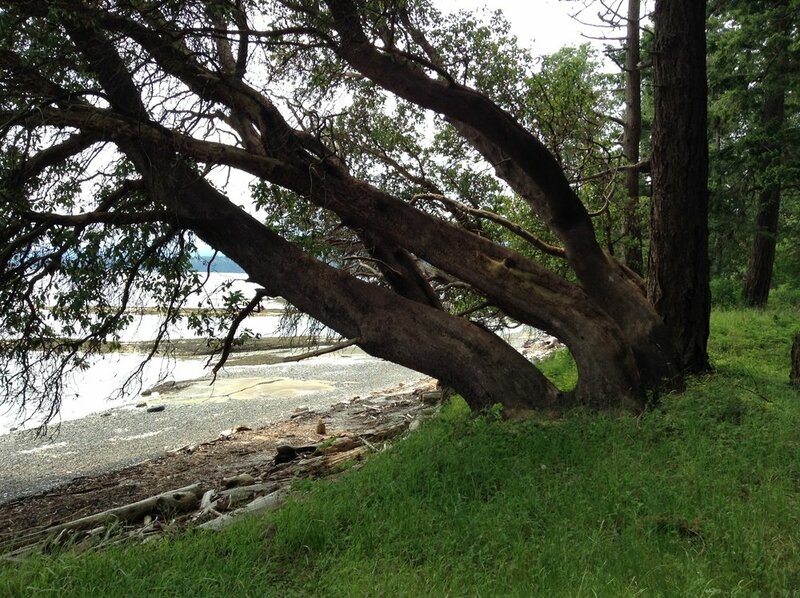 Over the coming months, Torrie is in the process of gathering wood and setting up his workshop in Vancouver. We are very much looking forward to his return for Vidar’s Chair. Brett from friendly Manitoba, is shown here with Marion, setting up the high fence to cut the veneer for his sailing exercise. Brett completed all the exercises in the Impractical Studies program. 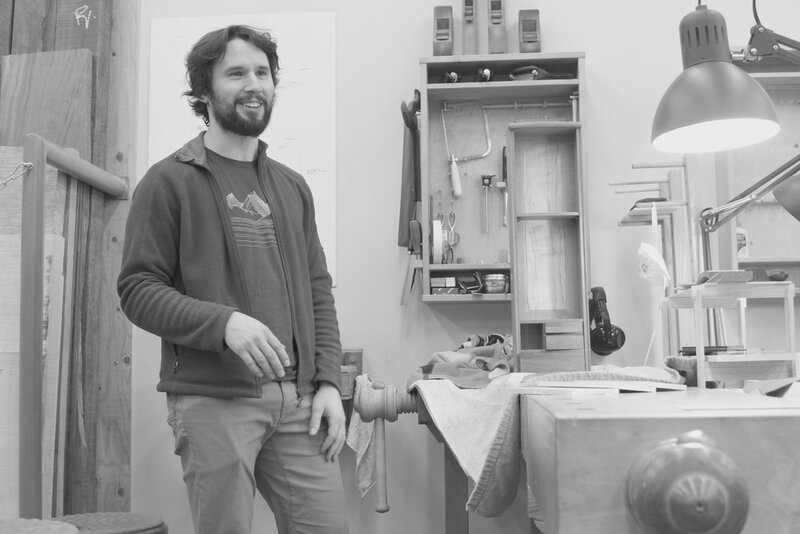 We are grateful that Brett will be staying on for the entire Impractical Cabinetmaker program. Brett shared with me just how much grateful he was to have Torrie, also originally from Manitoba as his benchmate in his first term. One of the benefits to having four programs running simultaneously at the school is the sharing of knowledge between students. 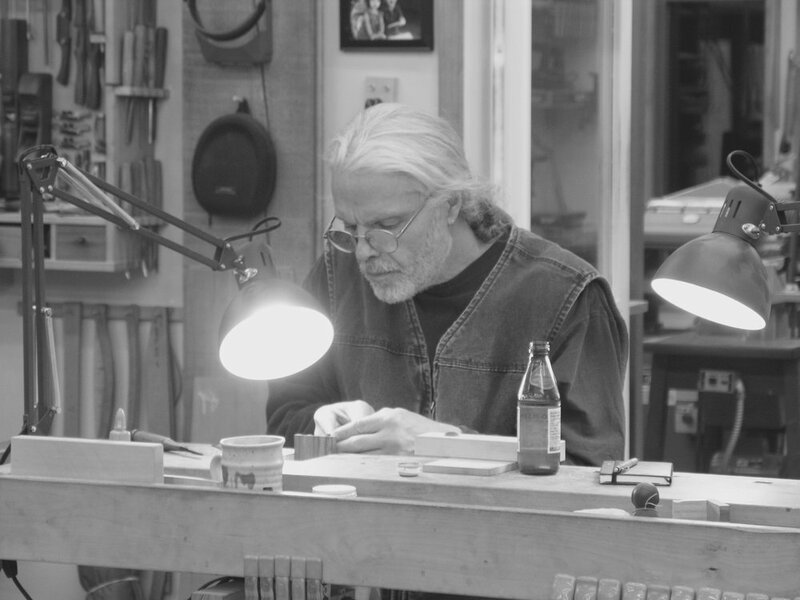 David, from Seattle shown carving the finger pull for his drawer in European cherry. Jim often suggested that knives were an often neglected tool. It is for that reason that we have always made and used knives in our work. When shaped thoughtfully and sharpened well, these very personal tools are as sensitive as any of our tools and capable of everything from rough shaping to the final surfaces, leaving subtle fingerprints, or finger candy. Each year, Yvonne and I retreat to a little cabin on Vancouver Island, where I have used the time to reflect on the previous year, in an effort to continually improve the program and our school. There has always been a rule though. Yvonne’s rule, that for the first three days I couldn’t talk to her about work. So, I would reflect and write in my notebooks. On the fourth day after her morning coffee, I was permitted to share my thoughts. This year was no different. I have often spoken about balance, I’m obviously a slow learner but for me the quote above says it all. Since returning to my own work, teaching has become a new playground for me, one I am grateful to share with so many curious students.